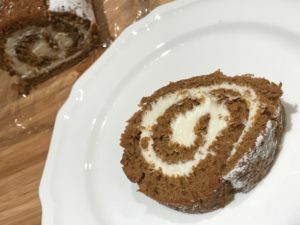 This Pumpkin Roll with Cream Cheese Filling is a Holiday favorite. Exceptional any time of the year severed with a cup of coffee. Way easier to prepare than most people think. Note: 2/3 Cups of Pumpkin is half of a 15 oz can of canned Pumpkin. So instead of wasting a partial can, plan on making a double batch (2 Rolls). The recipe above is for a single batch (1 Roll). Heat Oven to 350°F. Prepare a greased 10x15 jelly roll pan (cookie sheet). Line the bottom with wax paper, then lightly spray the wax paper with a spray oil such as Pam. 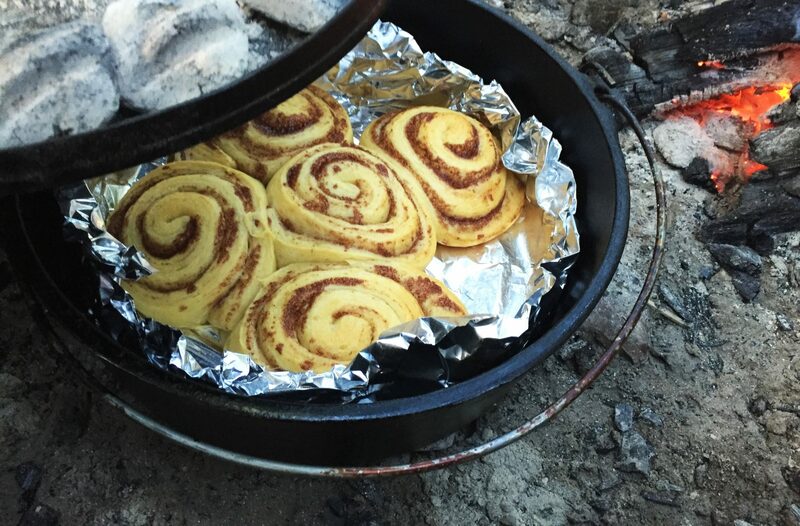 Lay out on your counter, a thin towel, sized at least the size of your jelly roll pan. Sprinkle it liberally with powdered sugar. In a large bowl lightly beat the eggs. Gradually beat in the sugar, beat until thick and light yellow. (4 to 5 minutes of beating). Add the pumpkin and lemon juice and beat on low until blended. In a separate bowl, combine/sift the flour, baking powder, spices, and salt. Add the sifted dry ingredients to the egg mixture. Whisk until well combined. Spread the batter onto the prepare Jelly pan. Bake in the preheated oven for 12 to 15 minutes. The cake should spring back when lightly touched with your finger. Start checking at 12 minutes, and at 1 minute intervals after that. Remove the cake from the oven and run a knife along side all edges to help release it from the pan. Immediately flip the cake/pan onto the powdered sugar covered towel. Gently lift the upside down pan away and the cake should remain behind on the towel. Gently peel away the wax paper and discard it. Starting on the narrow end of the cake, roll the cake and the towel up together to form a log. Place this on a wire rack to cool. While the cake is cooling prepare the filling. In a small bowl sift the powdered sugar and set it aside. Using a mixer, Beat together the cream cheese and butter until light and fluffy (about 4 minutes). Gradually beat in the sifted powdered sugar and vanilla. Beat until smooth. Once the cake roll is cool (needs to be cool to avoid melting the filling), carefully unroll the cake. Spread the cream cheese filling evenly over the entire surface of the cake. Then roll the cake and filling (not the towel this time) into a log, or roll. Wrap in plastic wrap and chill at least 1 hour in the refrigerator before serving. These can be made ahead and frozen. Slice the cake and filling roll into 1 inch slices. Keep leftovers in the refrigerator. Next PostNext WHY TAG YOUR COOKWARE?